In Monday’s Morning Lineup, we highlighted a number of factors which suggested that trade was not the primary driver of gains for Chinese stocks. Some of the factors we discussed behind this premise included the relative performance of domestic versus export-oriented Chinese companies, the performance of Financials, credit and capital flows, as well as market technicals. In addition to these factors, the intraday performance of the Shanghai Composite would also suggest that other factors were at work besides trade negotiations. Looking at a timeline of events, President Trump made the announcement that the US would be delaying planned tariff increases at 5:50 PM eastern time on Sunday. That was more than two-and-a-half hours before the Chinese market opened for trading. Therefore, if the rally was based solely on trade, one would assume that the majority of the gains would have been priced in at the open. 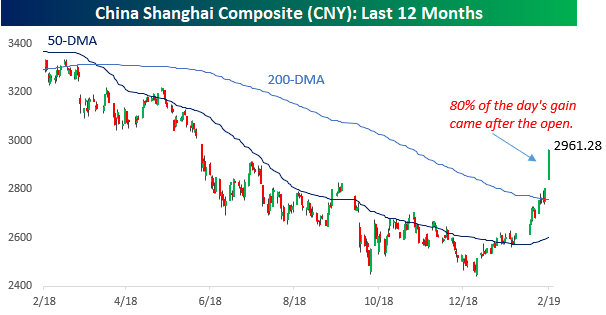 When Chinese equities opened for trading, though, the Shanghai Composite gapped up just 1.2% and then went on to rally more than 4% from the open to close. So either the Chinese market is extremely slow to digest news, or other factors played just as large a role in the rally as a delayed implementation of tariffs (that most people assumed was likely anyway). Now, it’s not uncommon for equities to rally on a particular piece of news and then have momentum add to the gains, but normally when events like this are the primary factor behind a move, the bulk of the gains would have been priced in at the open.